In 1963, when we launched the Cleveland Committee on Soviet Anti-Semitism (CCSA) to campaign for Soviet Jewry, we were ignorant of the Office, its mission, representatives, and agents. But by degrees over the next several years I, for one, got one hell of an education. The first Office representative we met was Meir Rosenne. The occasion was the April 1964 American Jewish Conference on Soviet Jewry. Also attending was Moshe Decter, head of Jewish Minorities Research. During the Conference each sought us out. Evidently our robust agitation for a national Soviet Jewry organization sparked their interest. Afterwards, Rosenne contacted us now and then by phone to inquire of our projects and plans; and several times during the next two years, he invited Herb Caron and me to meet with him in his office in Manhattan. I found him affable, urbane and most helpful for our needs. He provided boxes of offprints and newsletters, and arranged for us to receive gratis regular installments of several scholarly publications on Soviet Jewry. He was a fount of useful information Interestingly, at the conclusion of our get-together, another Meir surfaced: the bon vivant. He extended an invitation to dine at L’Orangerie, a nearby French restaurant. This portly young man clearly enjoyed conversation and fine food and wine. It struck me — given his likings — how fortunate he was to have a job he obviously enjoyed and a liberal expense account to boot. Outside of meetings at national events, my dealings with Moshe Decter were mainly by telephone and correspondence. To see a typical piece of correspondence, click here. Come 1966, a change of the guard: Meir prepared to depart and two new actors appeared on the stage. In early June I received a call from Meir, “could Herb and I come to New York to meet an important colleague?” We could. And on June 18th, at Meir’s office, we met Nehemyah Levanon, whose business card pronounced him Counselor Minister, Israeli Embassy, Washington, D.C. This short, stocky man with an avuncular manner averred he was impressed with our activities in Cleveland and wished to help further our work. In the latter regard, he suggested his recently commissioned exhibit, The Tragedy of Soviet Jewry. Some weeks later, I met Nehemyah at a Manhattan commercial workshop for a look-see at the finished exhibit. I was impressed and with his permission, the CCSA contracted with the workshop to fabricate a twin of the exhibit. Over the next three years, we made good use of the purchase, displaying it at several locations in the Cleveland area and renting out to groups in other cities. To view a portion of the exhibit, click here. 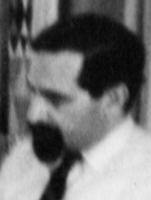 Yoram Dinstein, Rosenne’s replacement at the New York Consulate, arrived later in 1966. Nonetheless, Levanon continued as our number-one contact. He visited us in Cleveland, July 21st, “to provide information and advice” and telephoned frequently. During one of these phone chats, I mentioned plans to visit Israel in December. (I was invited to present a NASA technical paper at an international conference, in Vienna that November; following this, my wife, Evy, and I planned to spend three weeks each in Greece and Israel.) Directly, he urged me to set aside time to stop by his office in Tel-Aviv and suggested that Evy and I visit his kibbutz, Kfar Blum, in the Upper Galilee. Our trips to Austria and Greece went off with out a hitch. But directly on setting foot in Israel we hit a snag. Customs informed me that, as bearer of a diplomatic passport, my stay was limited to one week; on the other hand, Evy, with a tourist passport, was eligible to stay up to one month. What a blow: our grand three week trip aborted. I phoned Levanon and explained our predicament. He apparently was able to pull the right strings. The following day Passport Control notified me that an exception was granted: you can stay up to one month. Near the end of our visit, on the afternoon of December 30th, I headed for Levanon’s office. Following his directions, I turned up at Rechov Gimel, Mispar 7, in the Hakirya district. He welcomed me. I thanked him for his help in the passport matter. He showed me in to his small, sparse, unimposing headquarters and introduced me glowingly to the two people present: a senior colleague, Zvi Netzer , and a younger man, Ephraim Tari. The visit was short and nothing of substance discussed. At the time, I regarded it merely a courtesy and show of openness.